The European Union’s Trust Fund for Africa adopted last week a program worth €46 million to reinforce the integrated migration and border management capacities of the Libyan authorities. 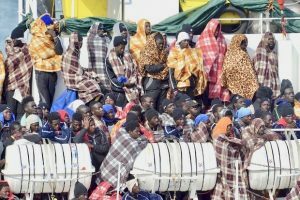 The new actions respond to the measures proposed early July under the European Commission’s Action Plan to support Italy to address the migratory flows along the Central Mediterranean Route, the European Commission said in a press release. The program aims at stepping up activities in support of the Libyan Border- and Coast Guards, to enhance their capacity to effectively manage the country’s borders. The program will be implemented by the Italian Ministry of Interior and co-financed by Italy. “Security and stability in Libya are key for the Libyans, the region and Europe, and they come also by better managing the borders and strengthening the resilience of the population,” High Representative/Vice-President Federica Mogherini was quoted as saying in the press release. Mogherini who renewed the EU’s resolve to keep working to reach a political solution to the political crisis in Libya and to continue to support the communities and the Libyan authorities to address the migration flows and related problems, said this new program is part of a comprehensive approach, covering increased border management, sustainable socioeconomic development of local communities, as well as protection, assisted voluntary returns and reintegration of migrants. This new program complements the €90 million package adopted in April 2017 to reinforce the protection and resilience of migrants, refugees and host communities in Libya. Under this program, a particular focus goes to improving the conditions for migrants and fostering the respect of human rights, improving the conditions in reception centers and working towards alternatives to detention. Overall, €136 million have been committed to Libya under the Trust Fund since January 2017, the press release noted. Written by: Peter Mulvany on August 1, 2017. Posted by Peter Mulvany on Aug 1 2017. Filed under Headlines, World News. You can follow any responses to this entry through the RSS 2.0. Both comments and pings are currently closed.